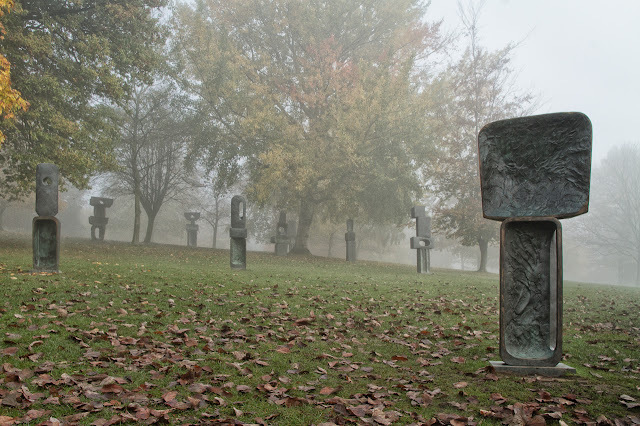 Continuing from my last post I went out a few days later to the Yorkshire Sculpture Park (YSP) at West Bretton when it was another foggy morning. I was a bit concerned when I was driving up the hill a few minutes from home as suddenly I was in full sunshine, but I carried on and as I could see in the distance that it still looked foggy ahead. When I arrived at my parking place there was plenty of fog so I started taking photos of the trees and also some mushrooms which I will probably post later. Todays post is purely some of the sculptures within the park. The first sculpture I photographed was one (and a bit) of the Barbara Hepworth ones which was looming out of the fog as I entered the park. 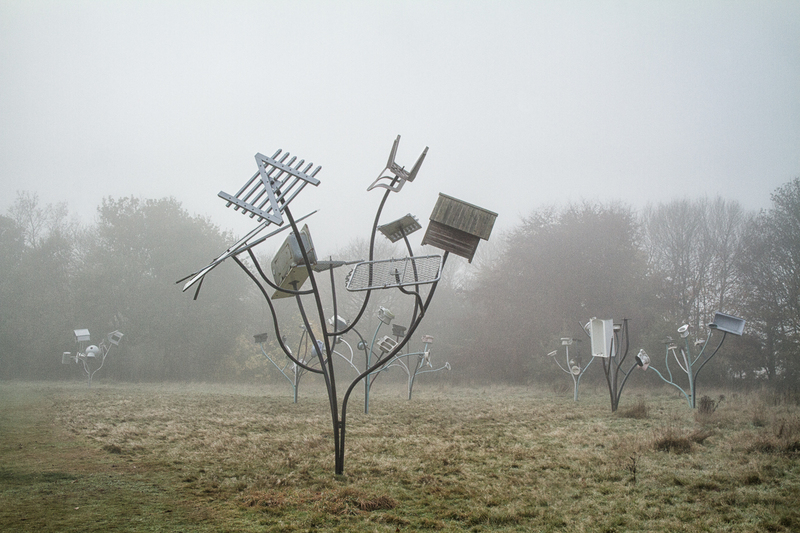 There are some more of the ten or a dozen which are presented in an area down the hillside. 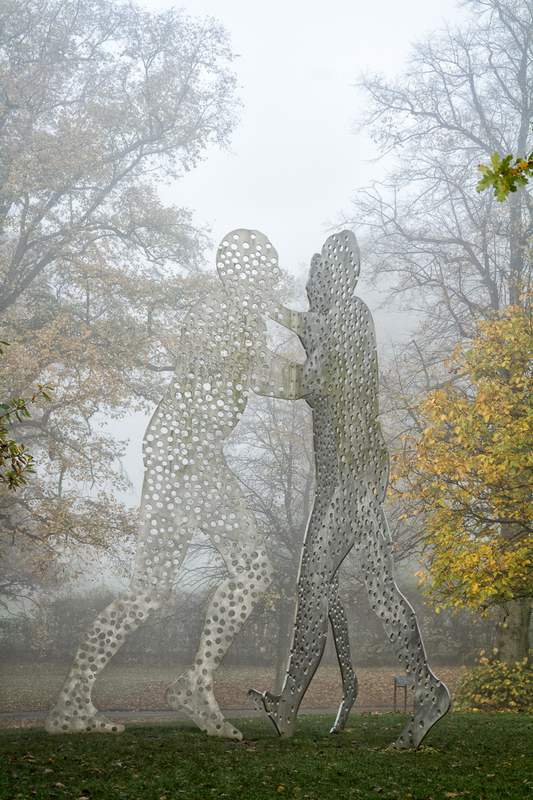 Adjacent to the patch of Hepworth sculptures are these very large holey men by Jonathan Borofsky which appear to be trying to push each other among the trees. 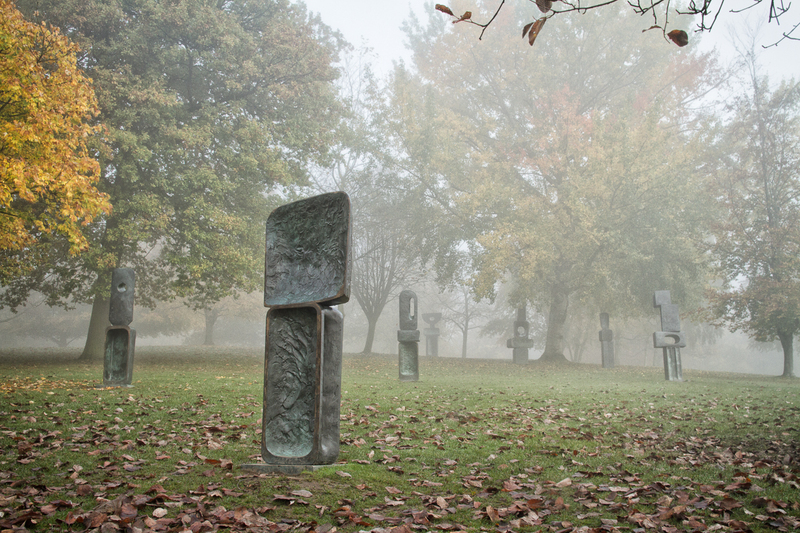 Here are another three photographs of the Barbara Hepworth sculptures as the fog was starting to disperse again. 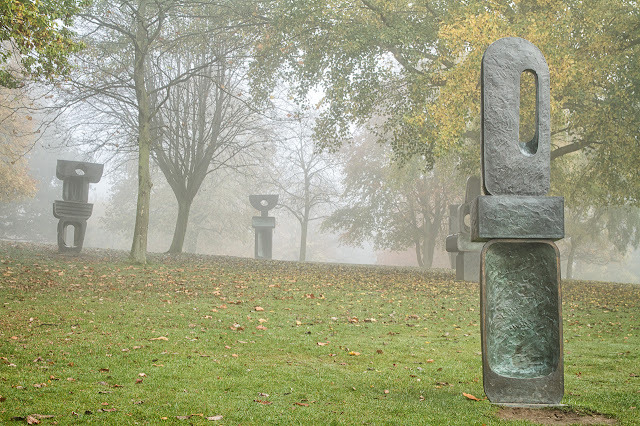 Further down in the field are these Dennis Oppenhiem "Alternative Landscape Components" which I have featured previously in one of my posts from the YSP. The mistiness makes them look more unusual than they are normally. At the bottom of the field I crossed the bridge between the lower and upper lakes where the top end of the poppy wave comes over the railings. I have some more pictures of the poppy wave in good weather and I will try to remember post them in a blog later. 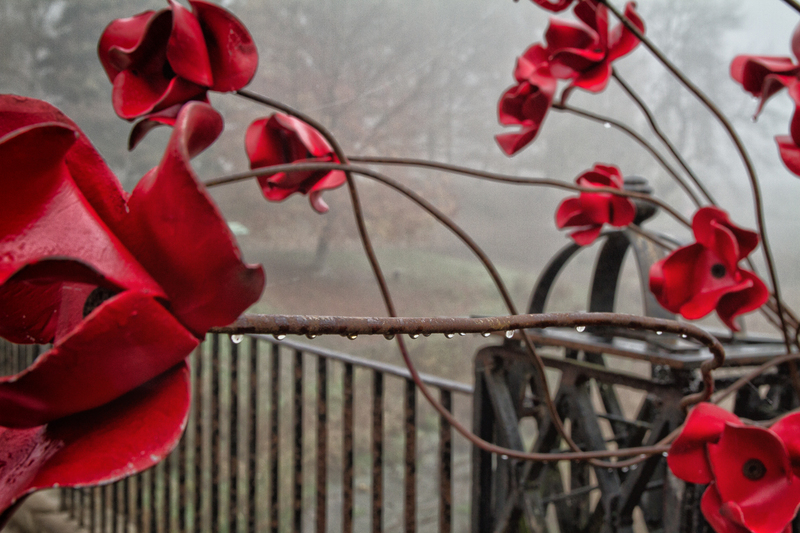 On this morning I was just intrigued by the drops of condensed fog on the stem of one of the poppies. 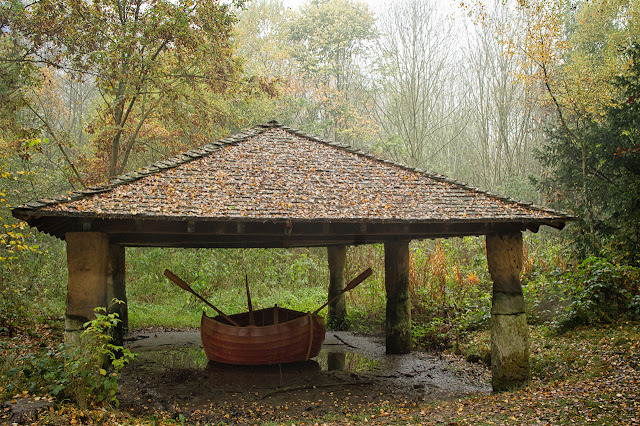 I walked around the upper lake to take some more photos of the autumnal trees in the mist where I also made this photo at the old boathouse of the work by JocJonJosch which is called Eddy (I think). Again I have features this three pointed boat in a previous posting but I like the effect that the mist has on the background trees. After I had walked around the top lake I went down the path at the edge of the lower lake to a small fridge which spans the water race which is used to managed the lake water levels. 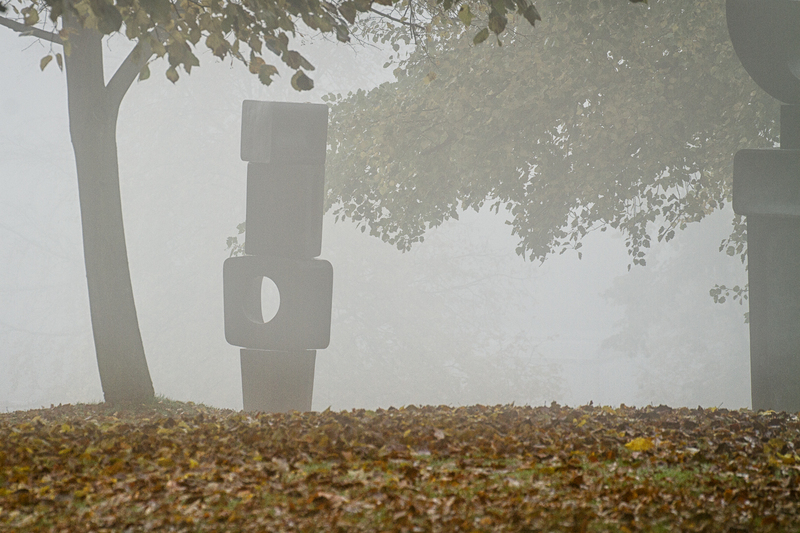 From the middle of the bridge I caught the set of Anthony Caro sculptures in the distant mist with the small duck in the foreground. It was starting to get busy around this area as we were approaching Remembrance Sunday and Armistice Day so there were lots of people coming to see the Poppy Wave so I decided to head off home and come back another day. I am hoping to get some photos of the Poppy Wave in either the ice or snow but the weather has been quite warm for the time of year so it's not happened yet. 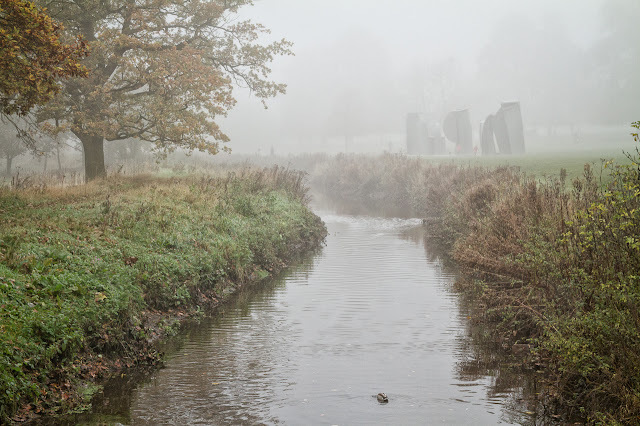 The fog started to thicken again so I took a few more shots on the way back to my car of the trees so I have quite a lot to edit down for inclusion in a later blog post.